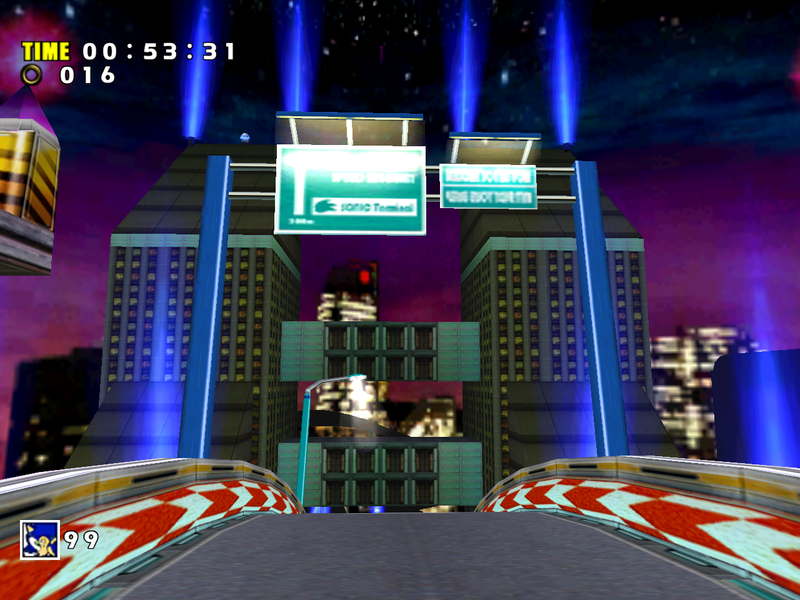 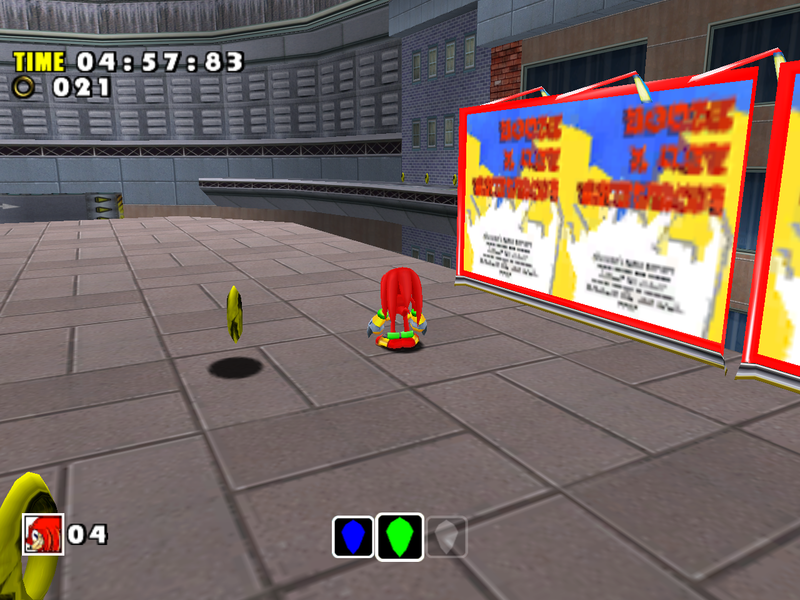 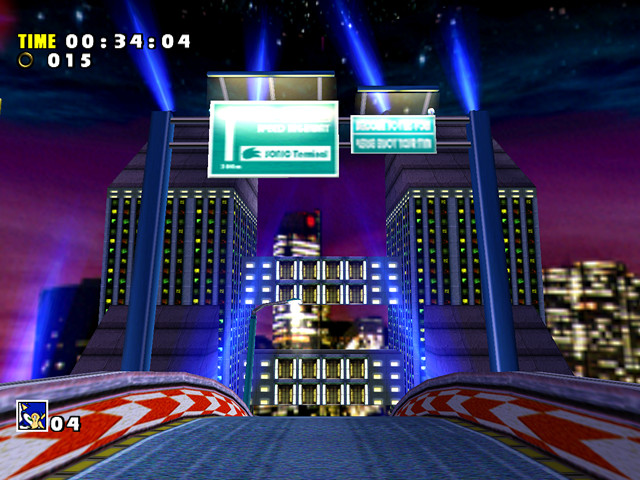 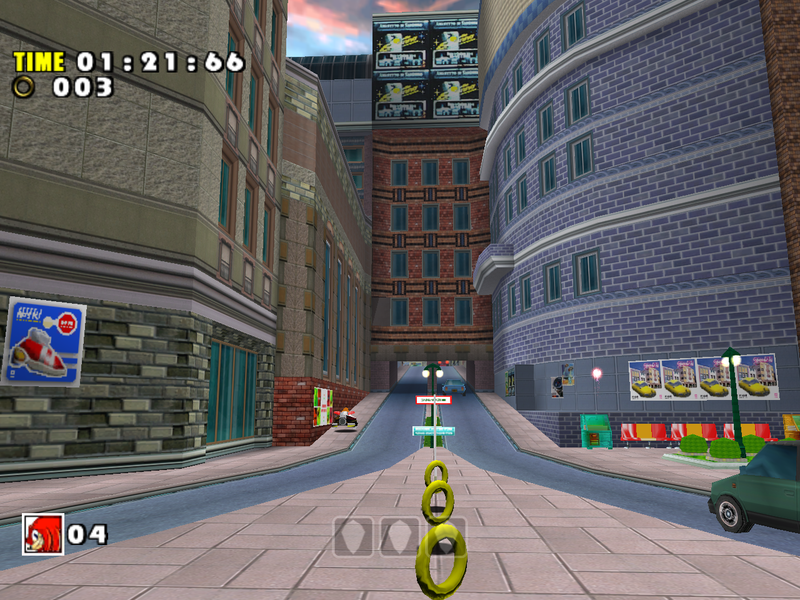 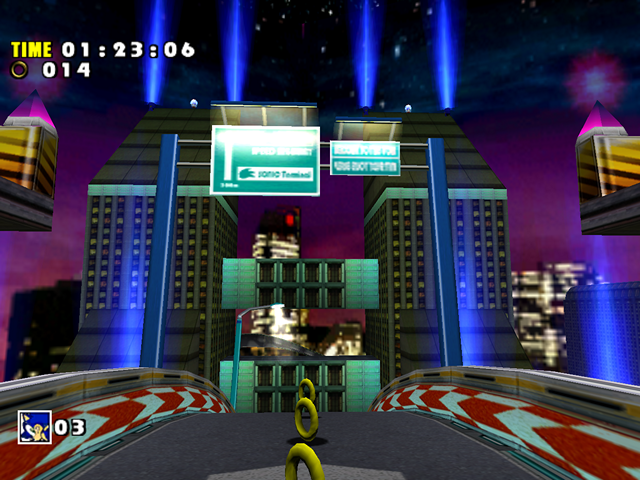 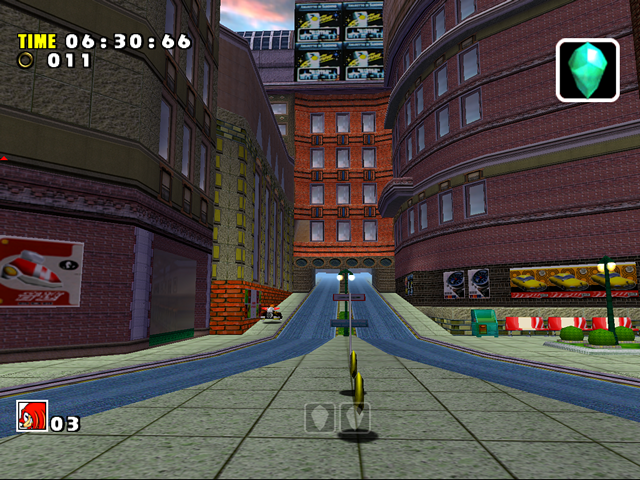 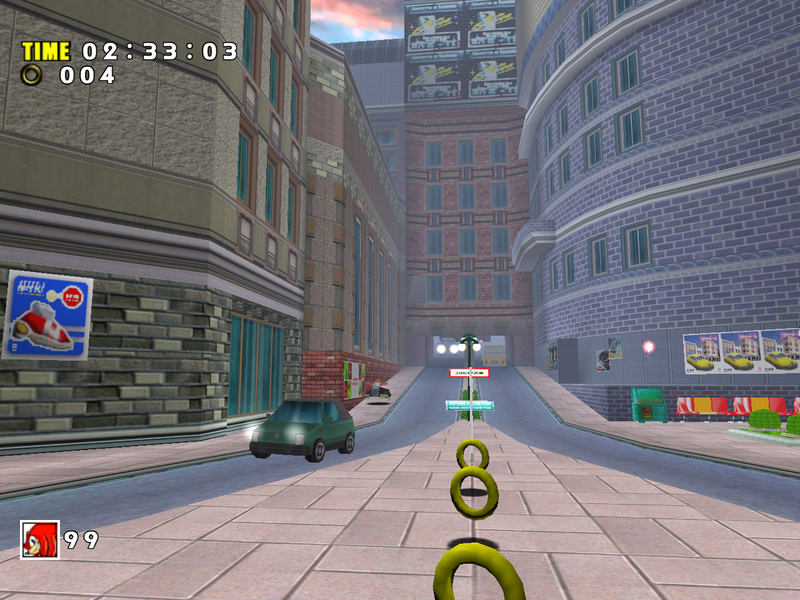 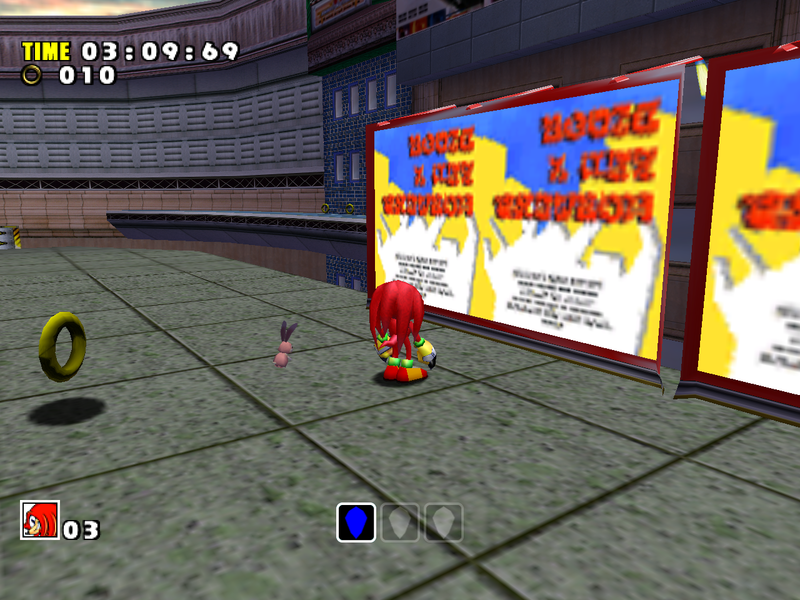 In the original Sonic Adventure, Speed Highway was one of levels that showcased the graphical capabilities of the Dreamcast to the fullest. When playing this level, you could feel that every little detail in it was designed to be a visual spectacle – much like in the rest of the game, but this particular level just pushed the hardware to the very limit. 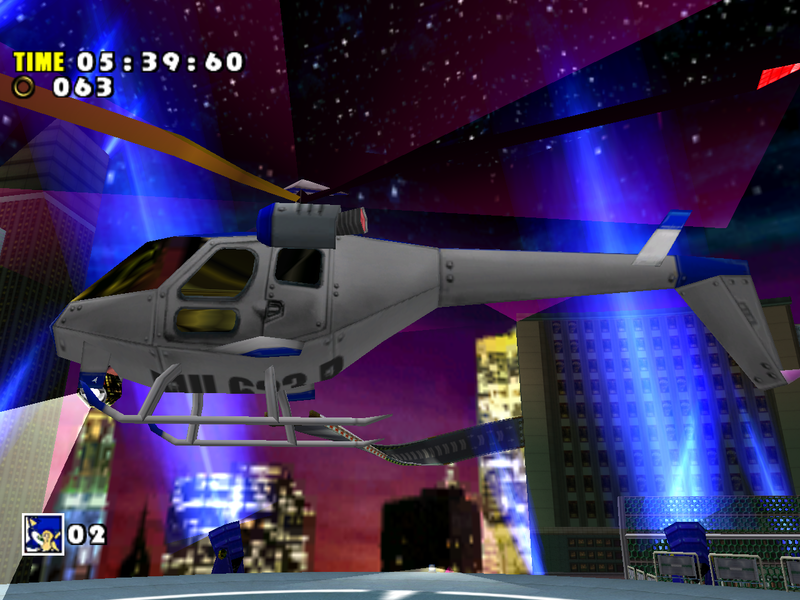 It was gorgeous to look at, with all the crazy lights, the roads going upside down, helicopters and the police chasing after you. 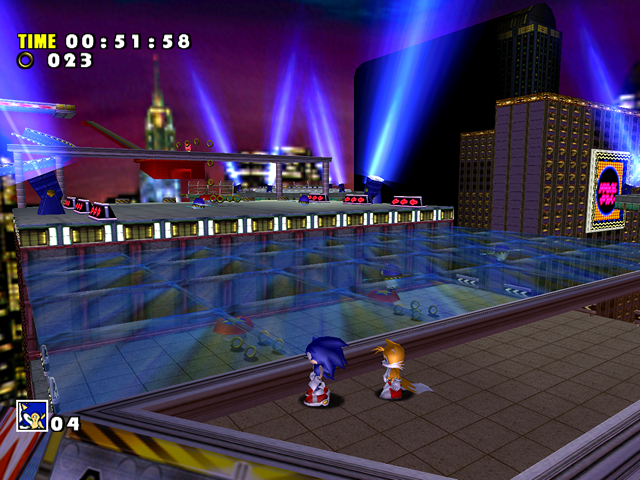 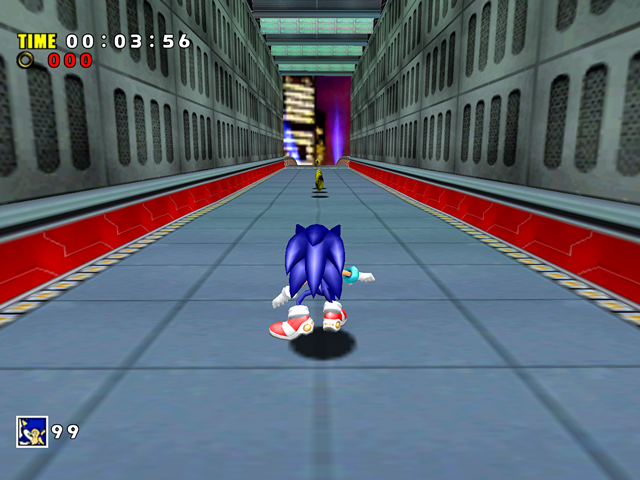 The scene with Sonic running down the side of a building is one of the most memorable moments in the entire game. 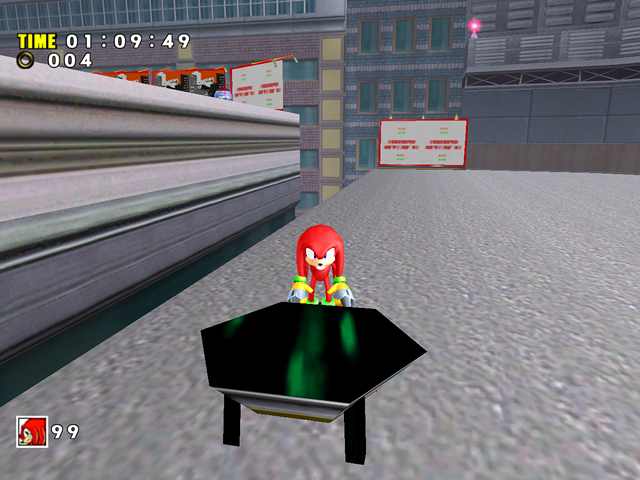 In all versions except the Dreamcast original there is a bug with the red transporter. 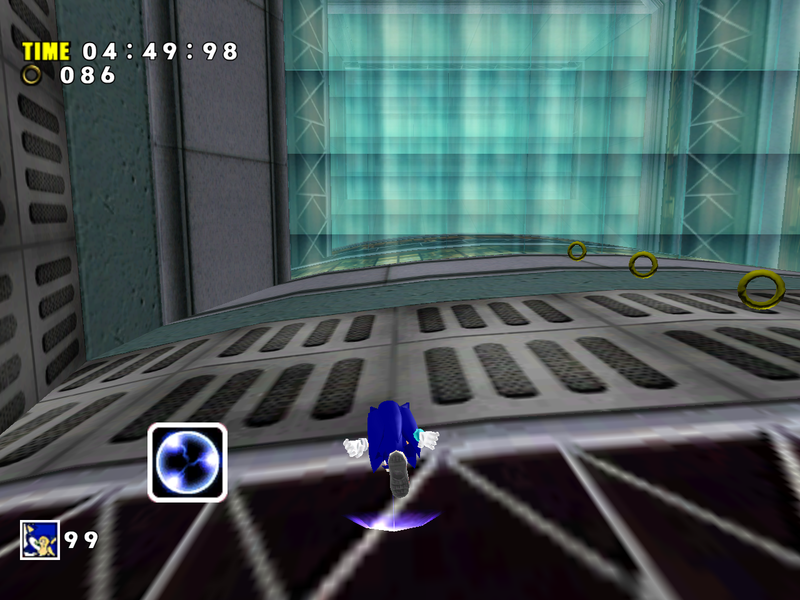 Its model has a material flag that enables transparency where it isn’t needed, making parts of level geometry visible through it. 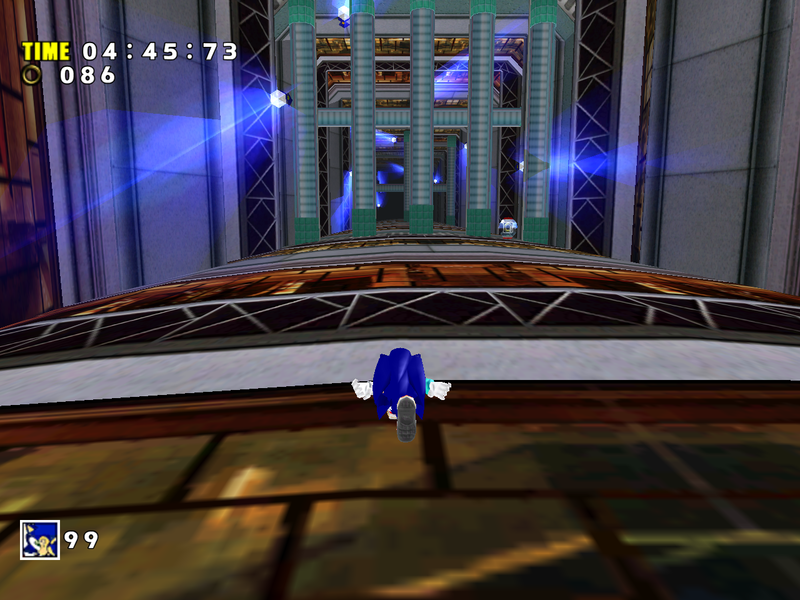 It’s especially noticeable in motion. The grabber basket that brings Sonic to the upper level has lost its shiny surface (environment mapping) and is now properly textured instead. The Dreamcast models use a low-resolution texture and distort it to get a “metallic” looking surface. 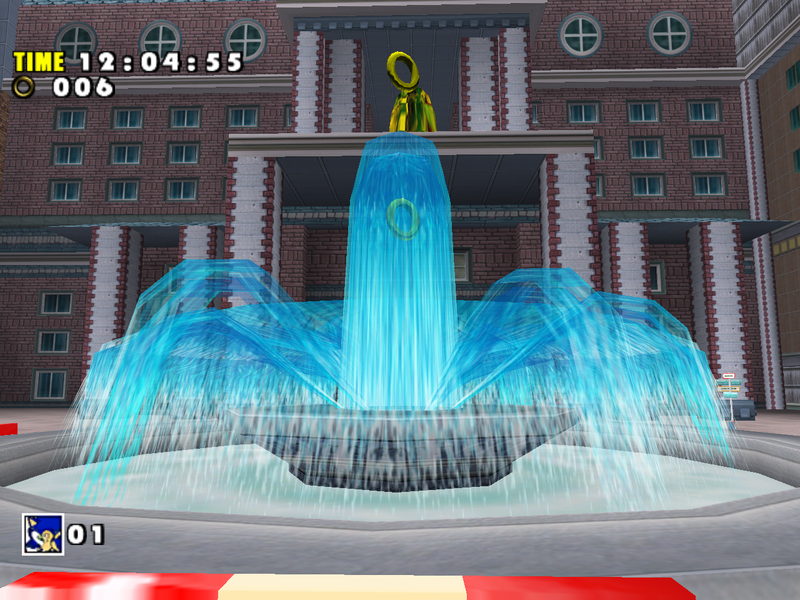 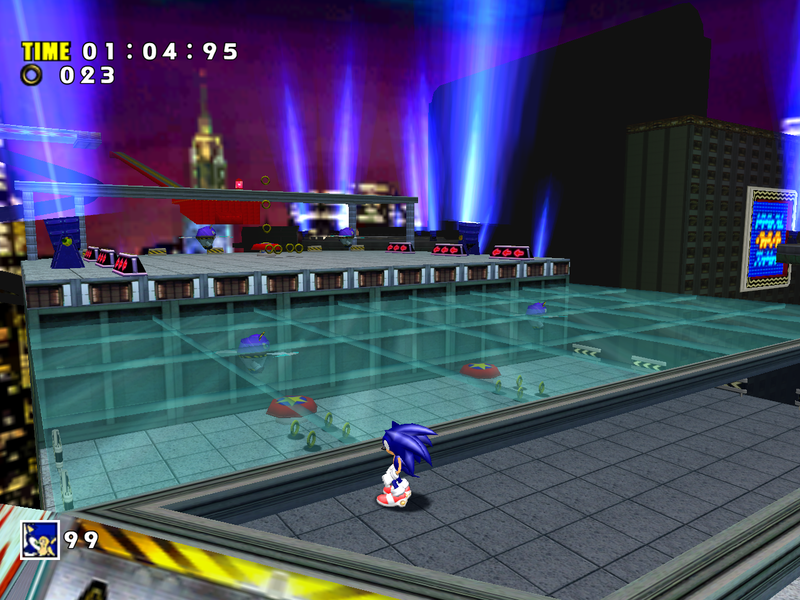 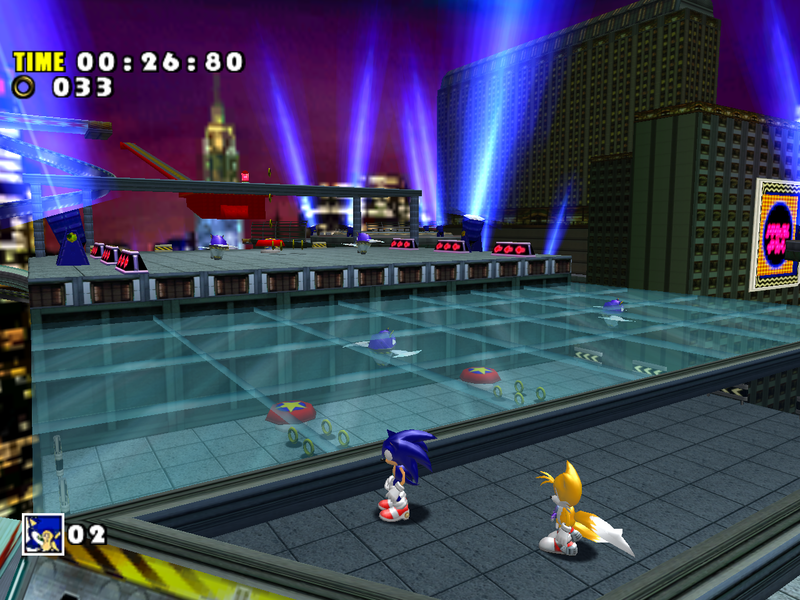 This effect is used by many models in SA1 and SADX – the lion in Casinopolis, icicles (SA1 only), window reflections in Station Square, cars (full models in SA1, windows only in SADX) etc. 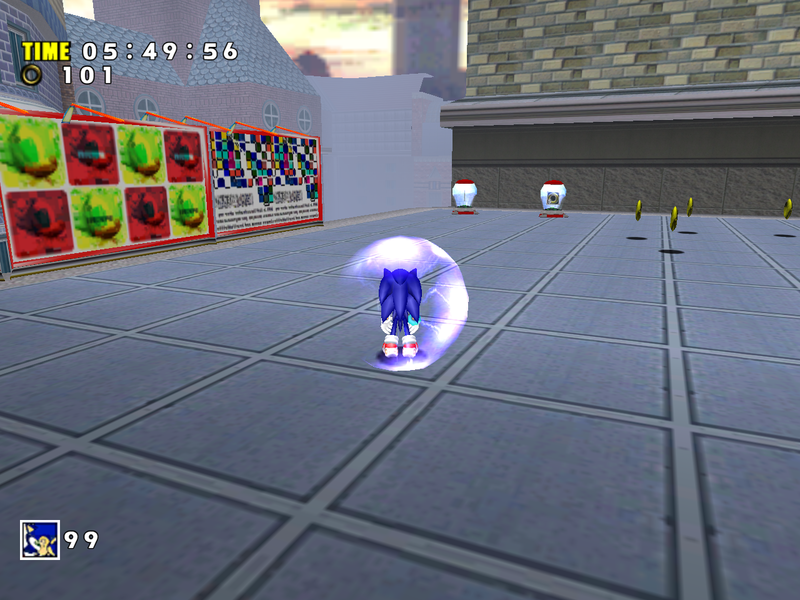 The Dreamcast version certainly relied a lot on this effect. 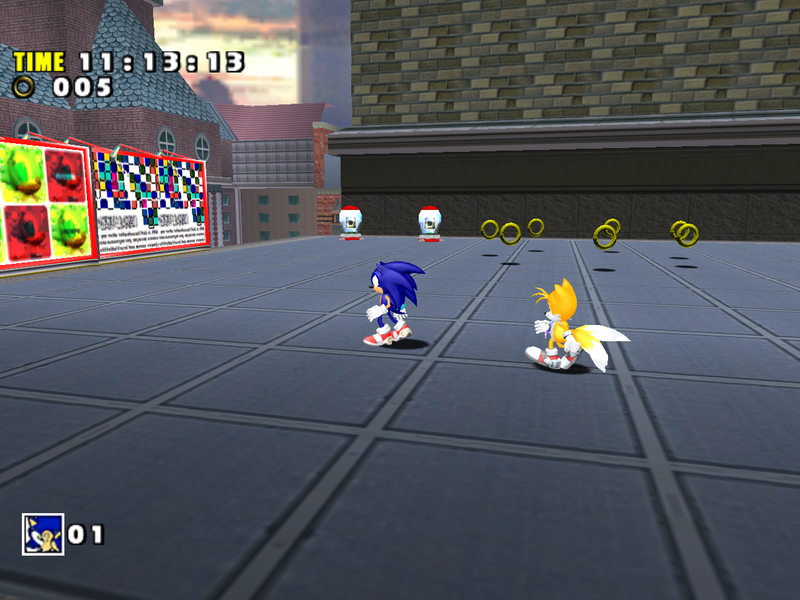 It could be argued that the SADX models added more detail by replacing this effect with proper textures. 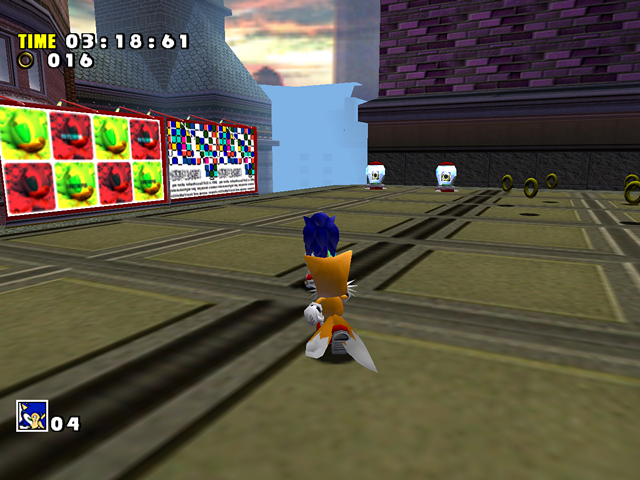 However, the models themselves were not improved and are still low-poly. 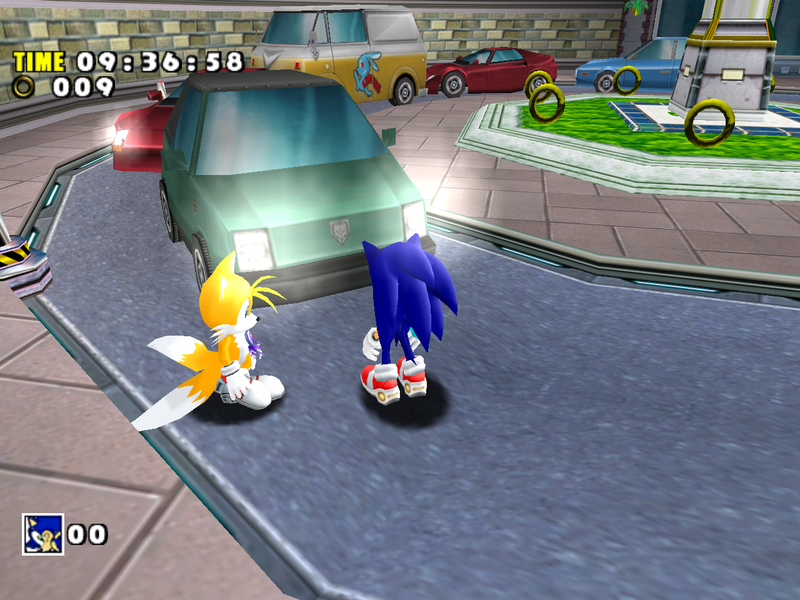 The removal of environment mapping in this particular case is both a good and a bad change: although the textures allow for more detail, the shiny effect (which is characteristic of metal surfaces) is gone, and the model ends up looking like a plastic toy. 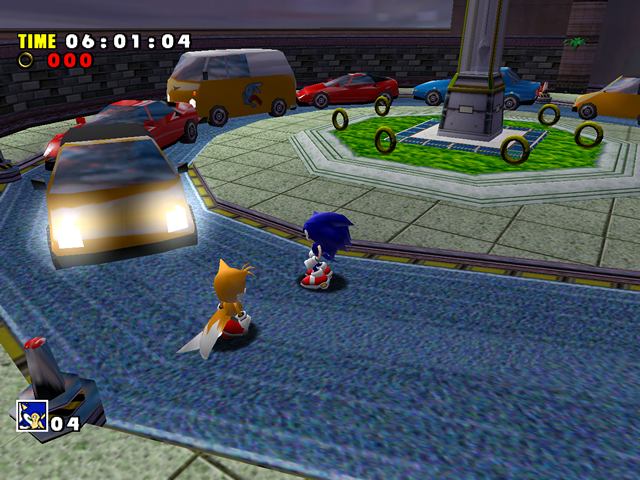 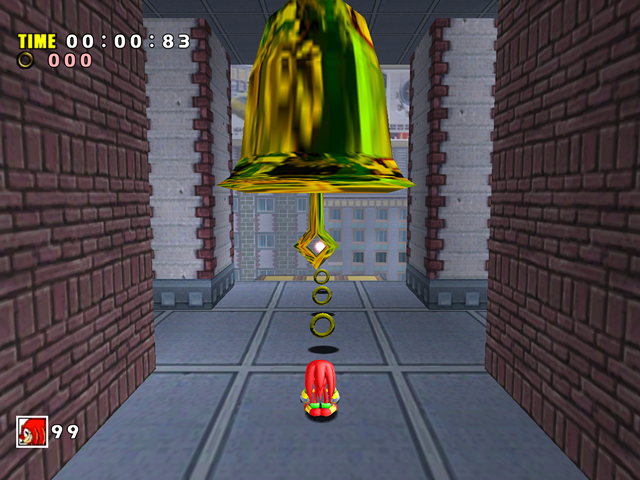 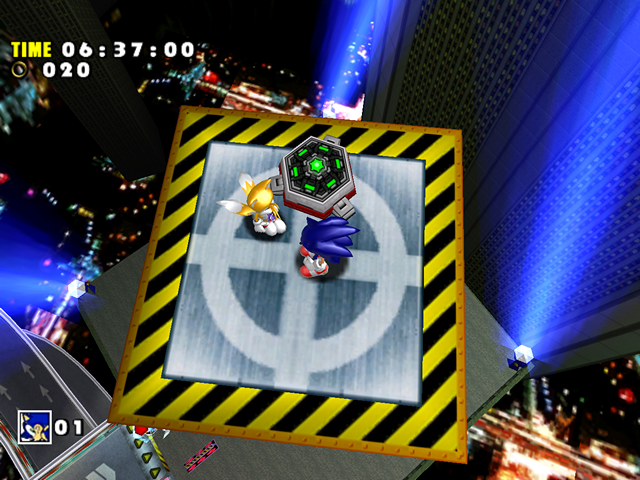 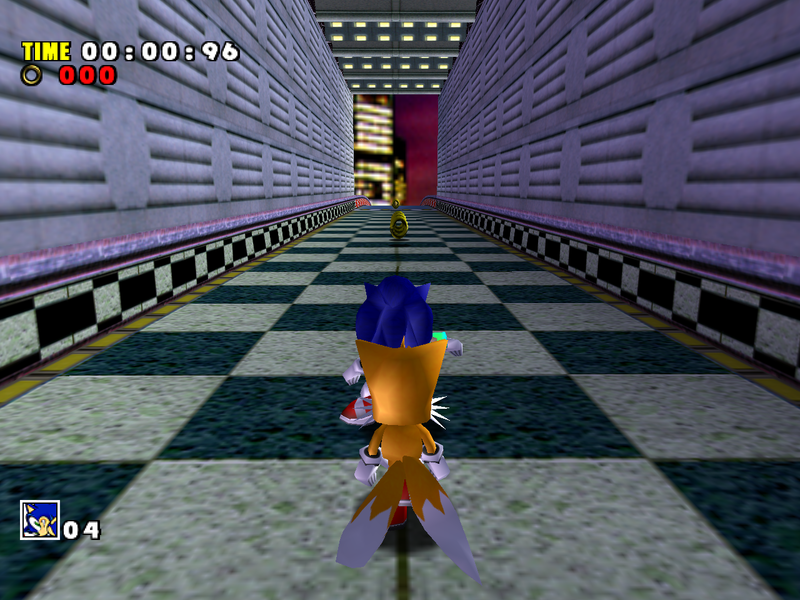 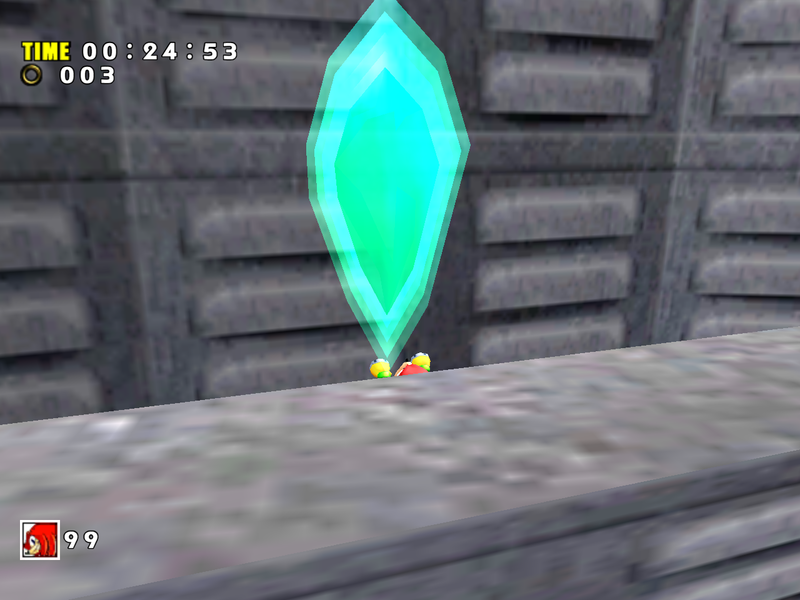 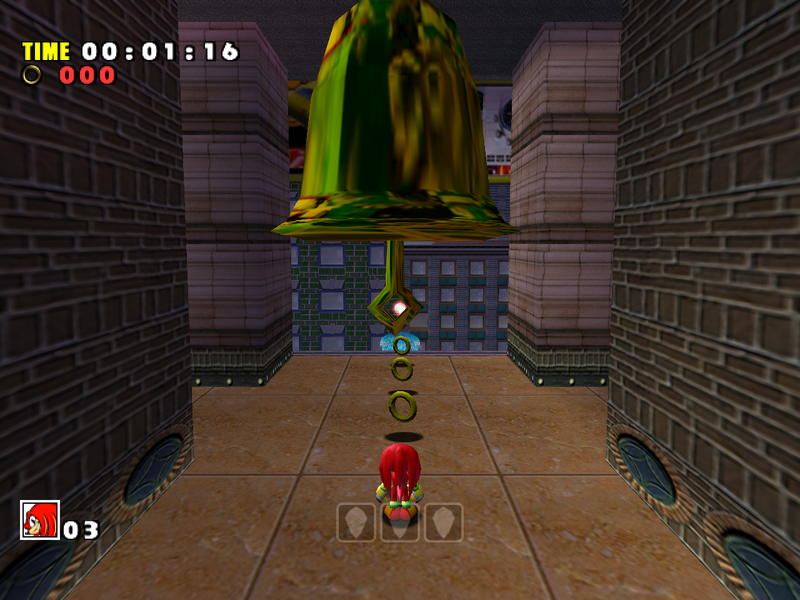 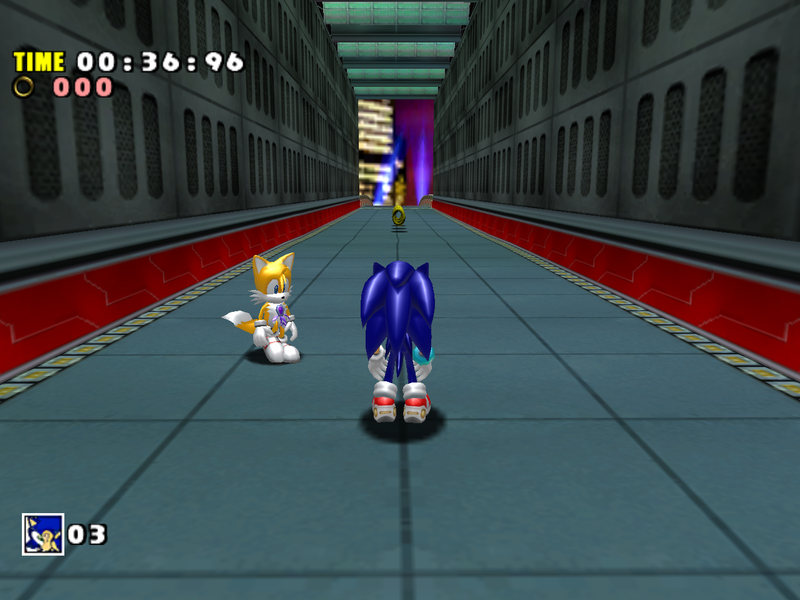 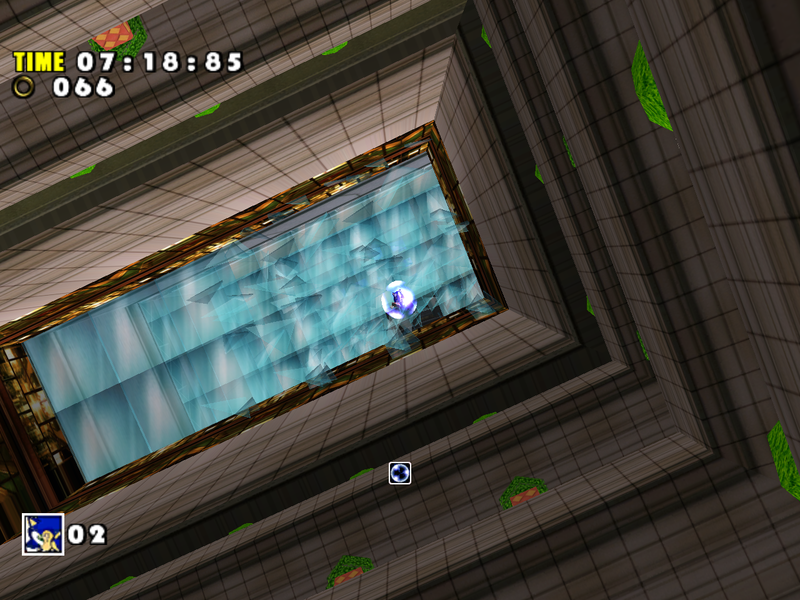 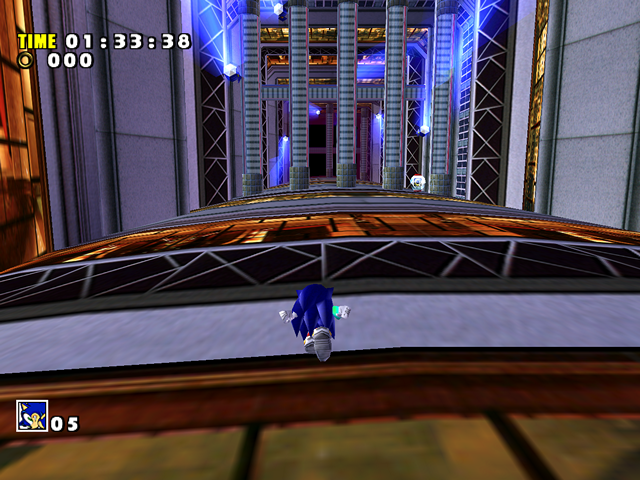 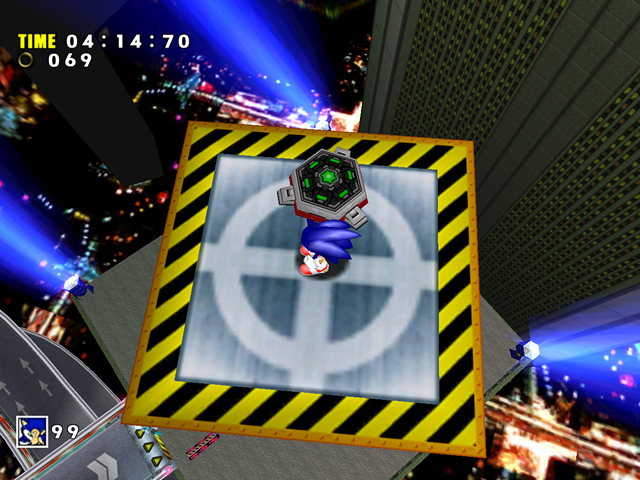 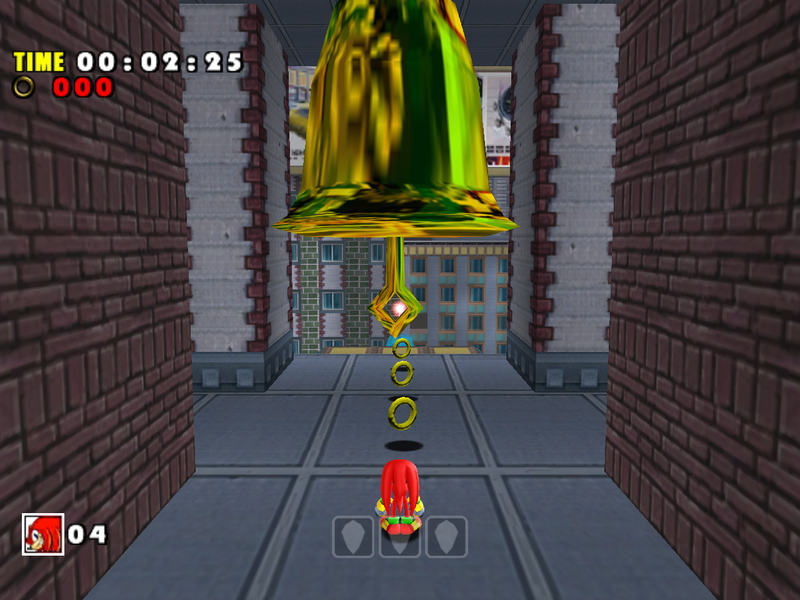 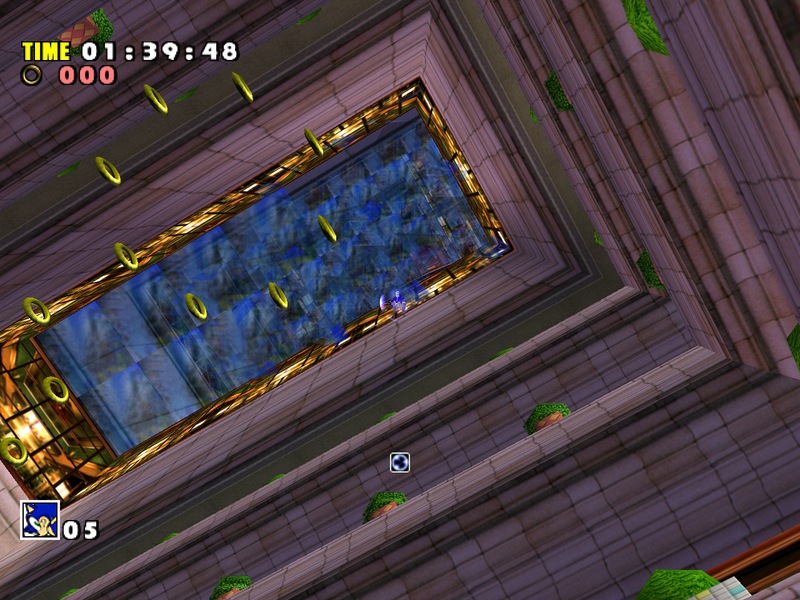 Speed Highway has several objects with blinking lights, which are seen more often in Tails’ level. This radar/satellite dish tower has a glowing light at the top, for example. 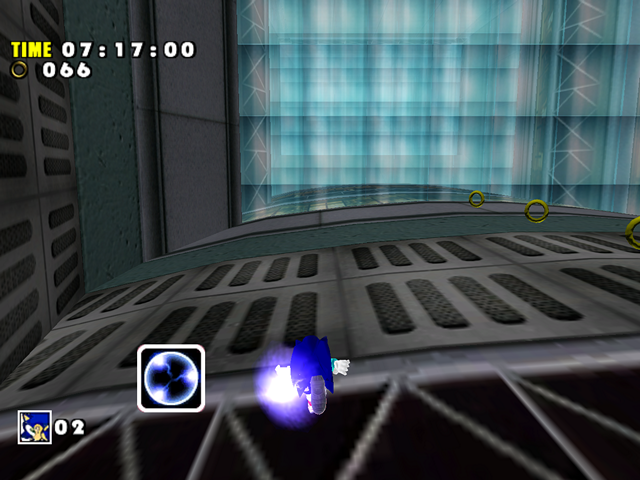 However, in SADX the light was disabled. 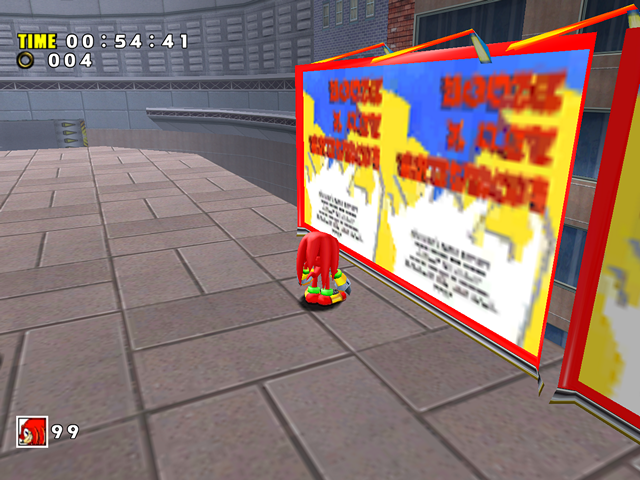 The lights are still there, but you can’t see them because SADX is struggling with transparency. 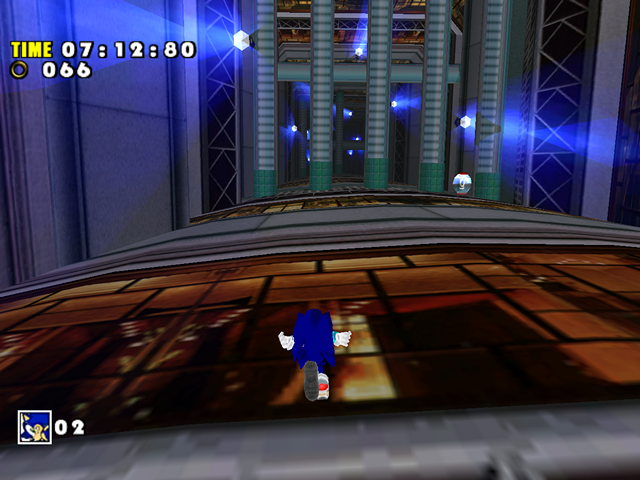 If you look closely, you can see that the smoke effect looks lower resolution in the PC version. 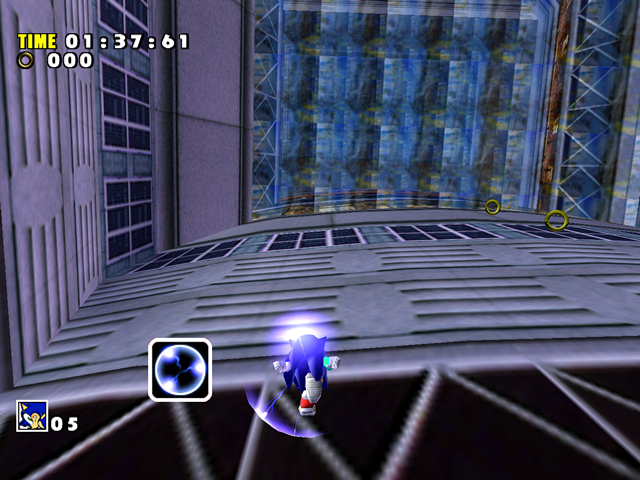 This is caused by alpha rejection, more on that in the Transparency section. 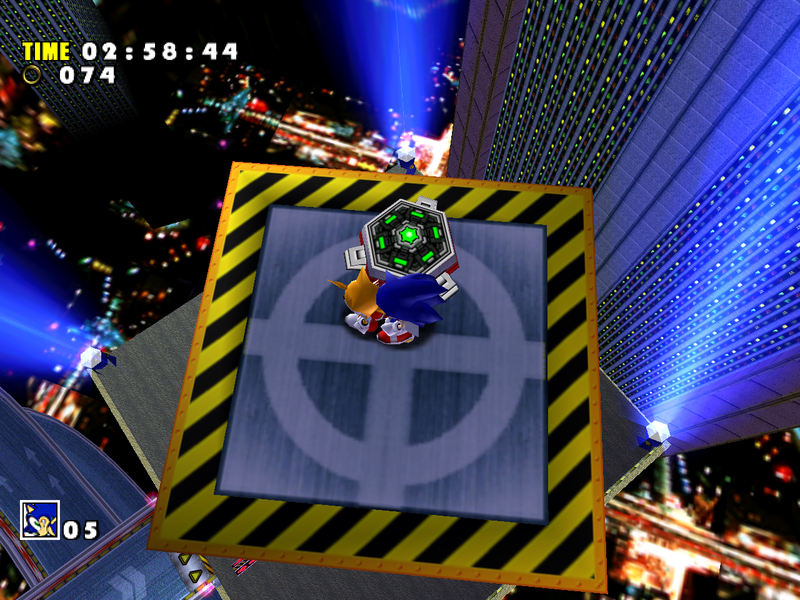 Minor complaint, but at the end of Act 2 there are no rings to collect using the magnetic shield that you get slightly earlier. 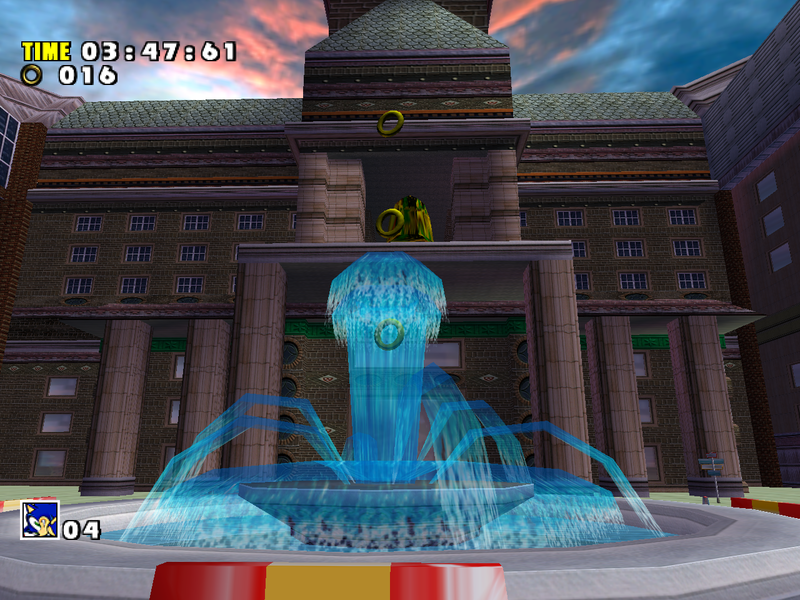 The SADX version of the level has no such effects. 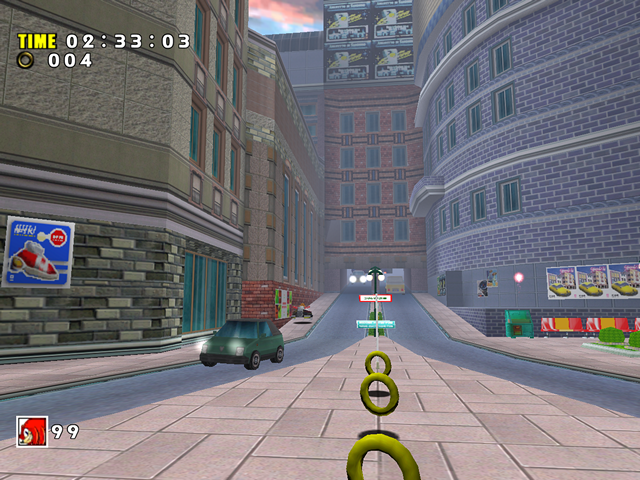 Although the game still supports environment mapping, all windows in the stage use a static opaque green texture that never changes regardless of where the camera is. For a supposedly “enhanced port”, this kind of quality degradation is unacceptable. *Not a video but you can still see it doesn’t have proper shading either. 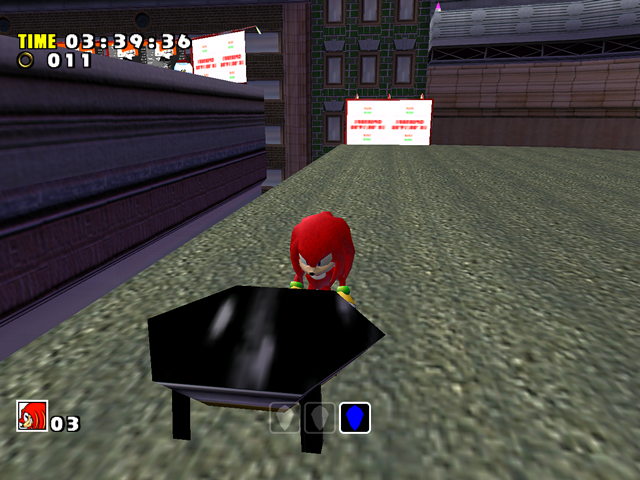 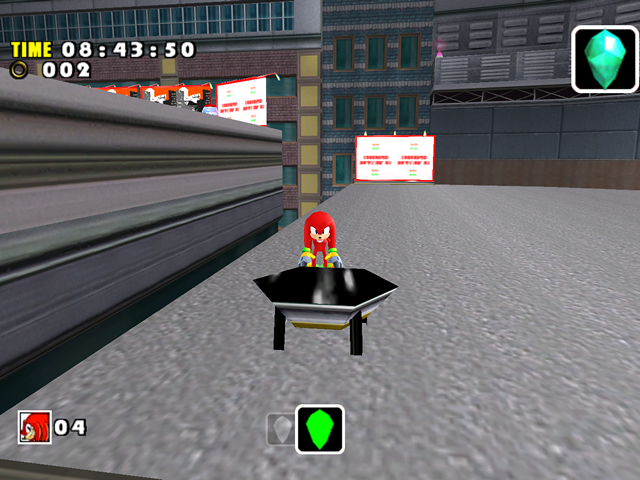 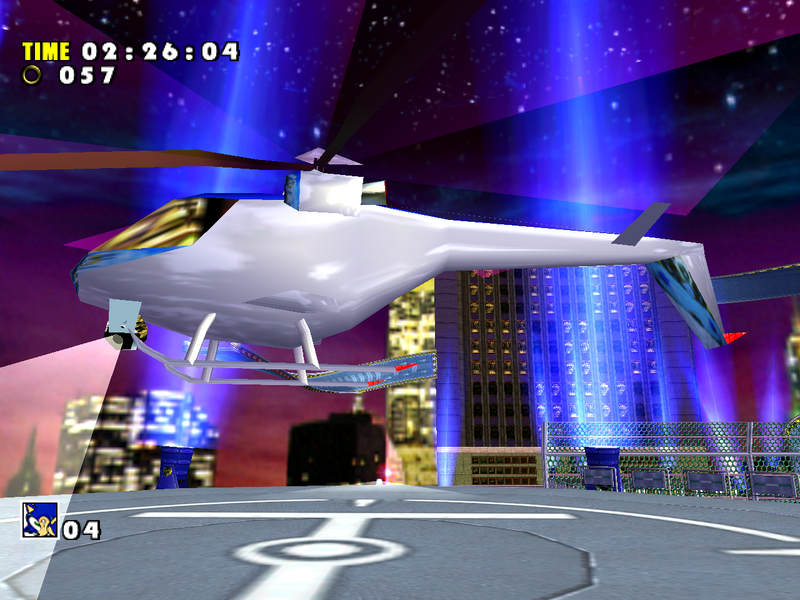 Speed Highway is one of the most severely downgraded levels in SADX. With Lantern Engine you can enjoy this level again with original lighting, and with Dreamcast Conversion you can have this level reverted to the original version with all transparency effects restored, as well as tweaked fog for better visuals. Check out the “Fixing the PC version of SADX” to find out how to install these mods.